This is my not-so-best-kept-secret. It’s an oldie but a goodie, and it’s been my ONLY consistent skin care product for the past five years. I have slightly olive toned skin that tans easily in the summer, but in the winter when I am sun deprived I naturally have very pale skin, think Snow White. I fully embrace my inner Disney princess, but pale skin is not very forgiving of dark spots and pimples. So one of my equally pale girlfriends brought this little pot of gold to my attention a few years ago when I asked her why her complexion was looking so perfect! 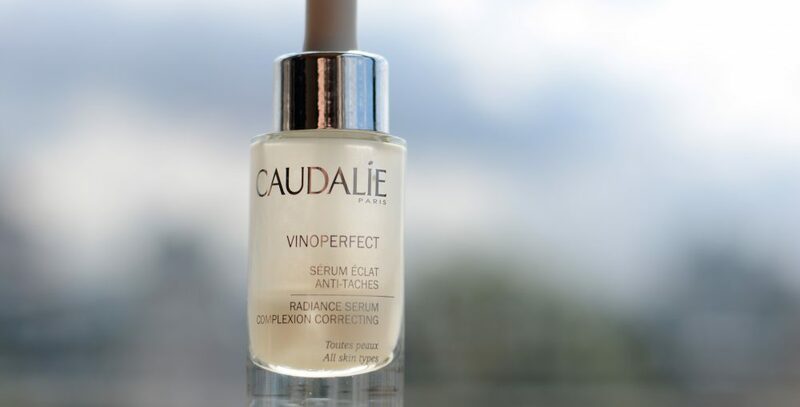 At this point I only knew of Caudalie for their Beauty Elixir, $19 and Cleansing Water, $16 (I wasn’t a natural skin care fanatic yet) so I was hesitant to spend $80.00 on such a small – albeit beautiful – bottle. Of course the beauty junkie in me rationalized its purchase and I skipped all the way home thinking that I’d just solved my dark spot problem. And, I had – take that pale skin! Don’t you love when that happens? I am totally fine to spend money on my face, but only if it works – my face is my job after all. While this product hasn’t been a cure-all for me (there’s no reason for me to believe it reduces acne) it’s definitely lived up to its No1 anti-dark spot product title. The acne reducing magic really happens in facial cleansers and moisturizers anyways. What I love the most about this serum is that it’s non-comedogenic (!! ), oil free (!!! ), and loaded with antioxidants & anti-ageing collagen and elastin stimulating components (!!!!!). In addition to a slew of face friendly ingredients, it has viniferine. Viniferine is Caudalies patented molecule (worldwide patent: EP1519709) from grapevine sap which is “the most effective natural molecule against dark spots and creating a radiant complexion.” I’ve said it before and I’ll say it again: this ingredient is 62x more effective than vitamin C and 4x more effective than kojic acid! It’s worth obsessing over. I apply this in the evenings (3-4 nights a week when I don’t apply my P50 Lotion of Glycolic Acid) to my chin, forehead and cheeks after my cleanser and before my moisturizer. I use two drops per application, so I go through one bottle in about 6 months. I definitely noticed a brighter complexion within the first two months of using this product, and I consistently find that acne scars don’t linger quite as long. But that paraben, sulfate, and phthalate free formula coupled with that beautiful fresh scent is enough to keep it a top shelf staple.